I have the need to look up invoices in Sales Order Processing by the Ship to Address. Until I setup Advanced Look ups to help me, I didn't realize how much time and effort I used finding the right invoice. I then expanded my use of Advanced Look ups to include GL Accounts. Wow, taking advantage of a small featured yielded me great benefits! AND IT'S EASY TO SET, how great is that? 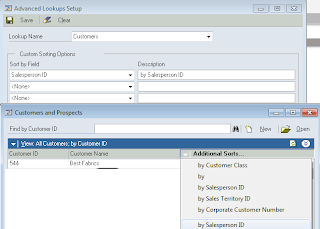 Select the list you want to add a custom look up feature to. 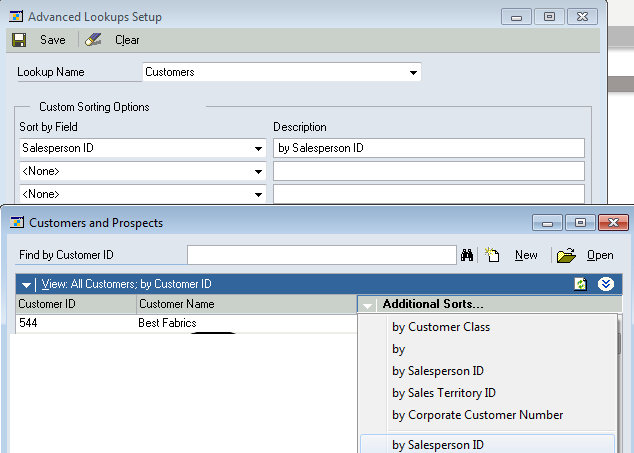 Choose from the drop down list in to the soft field (change the description name if you want) save and your done. The next time your in the that look up window, click additional sorts and now you can sort by your new custom window.